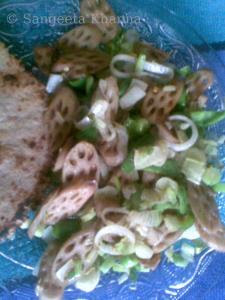 heat oil in a nonstick pan ( i use my cast iron one) n tip in the garlic , ginger n green chillies, in that order, one by one.......after a few seconds throw in the lotus stem slices n salt ............stir n for 3-4 minutes.......now add the capsicum n spring onions n the black pepper powder inliberal amounts ( preferably freshly crushed)..........adding the capsicum n spring onions later at this time allows them to remain crisp as i like it this way....if you want them wilted n slightly browned , you can add all the veggies together.........keep stirring and it's ready in 2 minutes. for multigrain roti.........make a dough with mixed flour( barley, oats , ragi,bajra, jowar n maize) and water.........the dough is not very pliable if there is no wheat ( as i have used it here) you can add wheat if you like..........without wheat it makes a bit thick roti with rough edges....like this one.............addition of wheat flour allows better shaping ..........from the dough make small round portions, flour n roll to make a flat bread n grill over a hot iron griddle.....(tawa)............both sides........the one here has a fabulous crumbly n chewy texture n i like the flavor it gives . 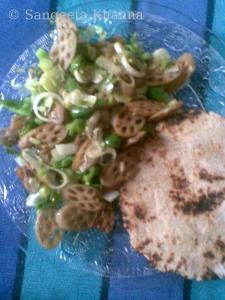 for diabetics healthy breads healthy breakfast healthy meals lotus stem multigrain/wholegrain stirfry veggies these foods helped me loose wt. 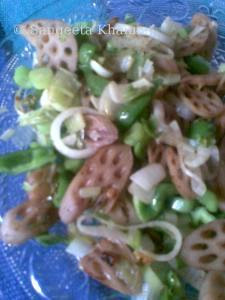 wow...this is soo simple and sooo nice... Good pic:) I have tried lotus stem -the dried salted and fried version.. Never tried it fresh... must try this recipe soon! very nice and different recipe! thanks kitti....i now know about your name....lotus stem is used in kashmiri cuisine mostly n they make many dishes like the chips etc..it's used in other norhtern states of india too. Hey have seen some frozen ones here in the Indian store...will try it out as I have never eaten this veggie...sad no??? yes sakshi.....it's a tasty n nutritious veggie....even it's not green.....my lotus stem stir fry posted earlier is considered a delicacy in our home. We get it at the Asian store here and I love it!! Will try your version and let you know how it turned out!